(Nanowerk News) Finland's Aalto University’s researchers improved their previous record by over three absolute % in cooperation with Universitat Politècnica de Catalunya. The researchers have obtained the record-breaking efficiency of 22.1% on nanostructured silicon solar cells as certified by Fraunhofer ISE CalLab. An almost 4% absolute increase to their previous record is achieved by applying a thin passivating film on the nanostructures by Atomic Layer Deposition, and by integrating all metal contacts on the back side of the cell. The development of the cells fabricated last year will continue in the upcoming “BLACK” project in which Professor Savin together with her team will develop the technology further in cooperation with industry. The results were published online 18.5.2015 in Nature Nanotechnology ("Black silicon solar cells with interdigitated back-contacts achieve 22.1% efficiency"). "The energy conversion efficiency is not the only parameter that we should look at," explains Professor Hele Savin from Aalto University, who coordinated the study. 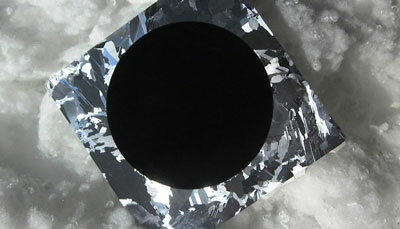 Due to the ability of black cells to capture solar radiation from low angles, they generate more electricity already over the duration of one day as compared to the traditional cells. "This is an advantage particularly in the north, where the sun shines from a low angle for a large part of the year. We have demonstrated that in winter Helsinki, black cells generate considerably more electricity than traditional cells even though both cells have identical efficiency values," she adds. "Our record cells were fabricated using p-type silicon, which is known to suffer from impurity-related degradation. There is no reason why even higher efficiencies could not be reached using n-type silicon or more advanced cell structures," Professor Savin predicts. "The surface area of the best cells in the study was already 9 cm2. This is a good starting point for upscaling the results to full wafers and all the way to the industrial scale."